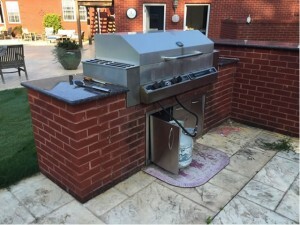 If your first outdoor kitchen did not turn out as you expected or you simply want to update your Built-In Grill and components Fine’s Gas can make it happen. We took this outdated kitchen island that was built in 2012 and turned it into what the customer had expected when they built it the first time. As you can see in the picture to the right you will notice that the built-in grill was not installed into the island as designed. The grill should have been recessed down into the island about another 6″. You will also notice that the propane tank will not even fit under the grill and has to be left as you see it in the image. Not real attractive. This is where the fun starts. 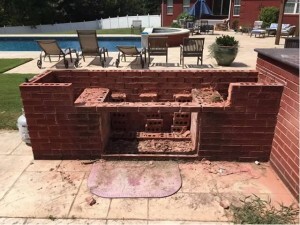 To stay within the customers budget we salvaged the existing brick island and gave the customer several built-in grill options that would fit within the islands measurements. The customer picked the 36″ American Outdoor Grill Built-In Grill for it’s well know name brand and quality in craftsmanship. To conceal the propane tank inside the island enclosure we cut the brick on the island to the right of the main island and added a Single Access Door With Tank Tray. The customer also wanted to add a Double Side Burner to right side of the grill and that also required some modification to the existing grill island. With the height of the existing grill island we had just enough room for a 36″ Wide Storage Door with Platter Storage & Double Drawer to fit under the built-in grill. The final steps was to rework the gas lines to supply the grill and side burner from the new propane tank location and add the required Vented Louver Panels to the island to allow for air flow. Once all this was done we brought on the new granite counter tops and then installed all the new outdoor kitchen appliances. 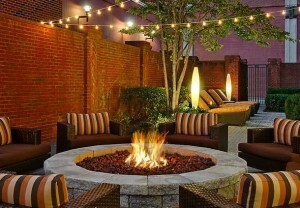 If you would like to know more about how to remodel your outdoor kitchen Contact the Experts at Fine’s Gas. This entry was posted in Outdoor Kitchens and tagged american outdoor grill, built-in grills, outdoor kitchen on October 3, 2016 by John Fine. 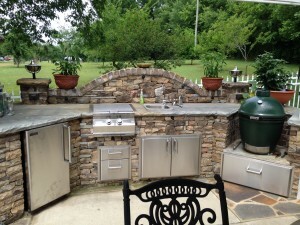 When designing an outdoor kitchen most commonly a built-in gas grill is desired. With many options available in today’s market we’re seeing more folks incorporate the Big Green Egg charcoal grill into their outdoor space along with an American Outdoor Grill or a Fire Magic gas grill as a norm. The kitchen pictured below is unique simple because it features the Green Egg as the only grill and is dressed out with a power burner, outdoor refrigerator, sink and several storage doors and drawers. 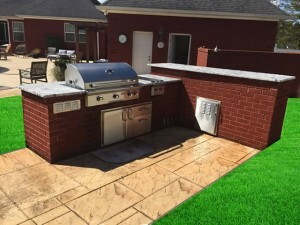 This entry was posted in Outdoor Kitchens and tagged american outdoor grill, big green egg, built-in grills, fire magic grill, gas grills, outdoor kitchen on June 20, 2014 by John Fine.